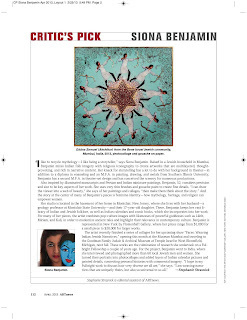 I like to recycle mythology—I like being a storyteller,” says Siona Benjamin. Raised in a Jewish household in Mumbai, Benjamin mixes Indian folk imagery with religious iconography to create artworks that are multilayered, thought- provoking, and rich in narrative content. Her knack for storytelling has a lot to do with her background in theater—in addition to a diploma in enameling and an M.F.A. in painting, drawing, and metals from Southern Illinois University, Benjamin has a second M.F.A. in theater-set design and has conceived the scenery for numerous productions. Also inspired by illuminated manuscripts and Persian and Indian miniature paintings, Benjamin, 52, considers precision and size to be key aspects of her work. She uses very thin brushes and gouache paint to create fine details. “I can draw the viewer into a web of beauty,” she says of her paintings and collages, “then make them think about the story.” And the story at the center of many of Benjamin’s pieces is feminine identity—how mythology, heritage, and religion can empower women. Her studio is located in the basement of her home in Montclair, New Jersey, where she lives with her husband—a geology professor at Montclair State University—and their 17-year-old daughter. 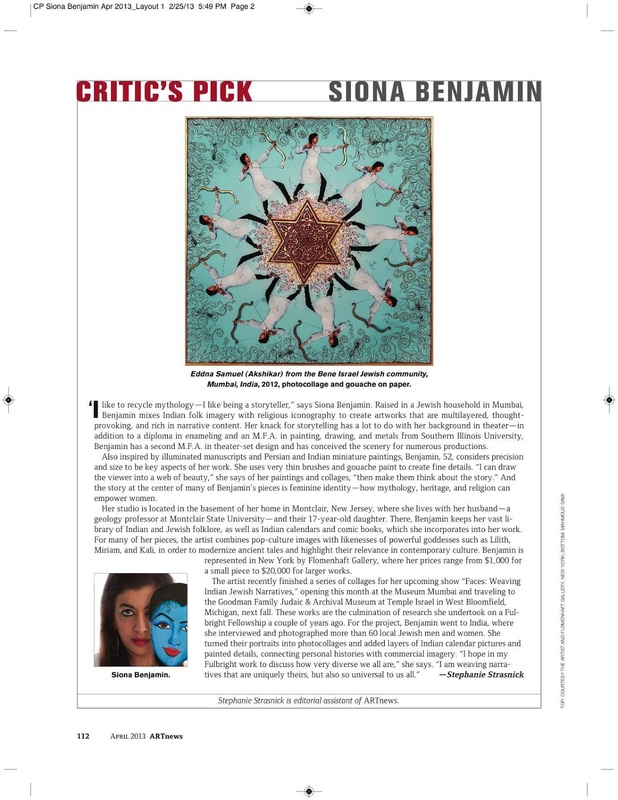 There, Benjamin keeps her vast library of Indian and Jewish folklore, as well as Indian calendars and comic books, which she incorporates into her work. For many of her pieces, the artist combines pop-culture images with likenesses of powerful goddesses such as Lilith, Miriam, and Kali, in order to modernize ancient tales and highlight their relevance in contemporary culture. Benjamin is represented in New York by Flomenhaft Gallery, where her prices range from $1,000 for a small piece to $20,000 for larger works.